Congratulations to Peter Donnison who completed the London Marathon yesterday in 3hrs 6 minutes. Peter wishes to thank everyone for their support and sponsorship. 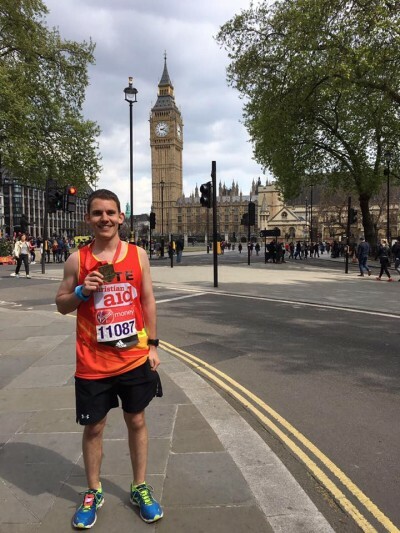 This year I'm running the 2017 London Marathon to raise money for the international development charity Christian Aid. As I go out on the long miles of training in the winter months the thing that is keeping me going is the charity I will be raising money for. Christian Aid work in some of the World's poorest communities to help people from all faiths and none to break out from living in extreme poverty. Many of the things we take for granted, the core essentials of life like clean water, are simply not available for millions of people around the World. Christian Aid work with local organisations on a wide range of projects including protecting people living in conflict, tackling issues such as gender inequality and violence, assisting people to deal with disasters and enabling people to bring themselves out of poverty through business, agriculture and education. In 2013/14 I worked for Christian Aid and experienced first hand the excellent work which they do and I encourage you to give as much or as little as you can to support this important and worthwhile work.